I’ve not had a great month to be honest. I decided to stop writing short stories so that I could concentrate on my novel. A good plan at the time, no, it’s still a good plan, I’m fed up with spreading myself so thinly lol. But, it’s not really worked out as I thought it would. The goal setting every week has been working well, to help me focus, but so far, I don’t think there’s been one week where I actually met them all. So this week, no goals…am I putting too much pressure on myself? Perhaps I just don’t believe in my novel enough. Perhaps I don’t really believe in myself and that’s the problem? Last week I lost 20 pages of editing. They just didn’t save on my Netbook and I don’t know why. When I’m editing I usually hit ‘save as’ (and check the file name) every 2 or 3 pages. I did that, then the following day I did the same for the next 20 pages. So imagine my horror when I next opened the file to discover that the second lot had completely saved, but the first lot had disappeared! 😦 I just wanted to cry, and I haven’t touched it since. I’m too scared to. Or is that just an excuse? I hope all my fellow Insecure Writers are having a better month 🙂 Will pop in and see as many of you as I can over the next 24 hours. So what are you feeling insecure about this month? 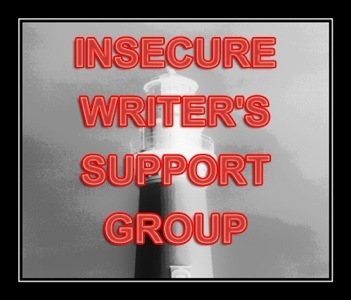 This entry was tagged Insecure Writers Support Group, Writer, Writer Resources, Writers Resources, Writing. Bookmark the permalink. A quick response as I have to go out this morning. I need to ponder about my own insecurities, before I write about them. Hi Vikki. I don’ t know if this helps but your site is one of the few blog sites that I have bookmarked to visit every chance I get. I even follow your blog, so I get the email, too. I just don’t want to miss anything you write. So, in that regard, yes, you are absolutely supposed to be in that room with those other writers and you are meant to do this. I get what you mean about the goal setting. There is a point where if you aren’t meeting them consistently, you say to yourself what’s the point. But, I would keep writing them and keep striving for them. Maybe you should change your mind set a little. Don’t make goal list, make to do list. That way you are always striving to finish your “to do list” without the pressure of reaching some goal that maybe to lofty or unrealistic. You have to celebrate the effort as well as the finished result. Yes love the blog, you are meant to be a writer, keep up the goal setting it definitely helps maybe set Mon-Thursday – then revise – set Friday to Sunday. perhaps what you edited out was not supposed to be edited out – there was something important there that you will realize later and be thankful for – sometimes we should not “kill our babies” and this was the universe’s way to tell you. Or it was just bad luck – but I prefer the former to the latter. the very fact that you are attempting this whole thing is a good thing–pat yourself on the back and do not ruminate so much (am I talking to you or me here?) Anyway, best of luck, and keep on plugging……….. I too lost an entire chapter once. I panicked, asked my husband to help me find it and we tried for two days. Nothing worked, so I did what girls do I cried, I was so sad that all that work was lost! It took me a couple days, but I finally began to rewrite it. Was it a better chapter, I have to think so, but I suppose I’ll never know. Keep moving forward, and yes girl, you ARE a writer and belong with the best of them! *Hugs* We all have moments of insecurity and doubt. I learned that staying up to write past 3 AM is a bad idea. I actually questioned if I should toss the whole story I was working on one night lol. You are a very good writer, Vikki. I am sorry to hear you lost 20 pages of editing. Ugh! Why must this happen? That happened with both of my first novels and it is frustrating. Honestly, if taking a breather for a few days helps you, then maybe do that and work on a short story to get the inspiration flowing and your confidence jiving. One of the huge downfalls of writing via an electronic medium….technical problems! We all have them, but don’t let that add to your discouragement. You absolutely deserve to be in the same room with the others. Because you made the effort to be there. Never, ever, ever give up, babe! Keep those words flowing. PS: I’m a fellow IWSG member. Nice to meet you! Rough month, chica. I would cry if I lost 20 pages, and it would take me a while to get motivated again. One reason I’m drawn to IWSG is that we ALL have insecurities but on the outside we might not show them. This group is a chance not to feel so alone with our self doubts. Here’s hoping that June will be a much better month for you! This month I find myself battling my inner critic over 2012 goals. Like you I feel like I’m spread pretty thin, but I’m hoping my determination will overrule any doubts! I’ve asked myself those same questions but I think that if you’re a writer because you can’t help yourself. You need to write. So insecurities be damned. You’ll never know if you don’t keep trying. Failure, rejection, and constant revision are just part of it. Rather than feel defeated, look at the set backs as opportunities to learn something to make you an even better writer. If the current manuscript is stuck, do something else for a while, but keep writing. Logjams have a way of breaking loose and when they do, things move fast. Having a couple of manuscripts on the back burner in various stages of development might even come in handy! My insecurity? Am I the only person on the planet that doesn’t know what Nano is? Fellow writer from IWSG here. After a trojan hit my computer, I recently lost a ton of files to include two WIPs. I have them backed up on an external harddrive, but when I scanned it there’s a virus on there too. *Groan* The thought of starting over makes me sick, but I refuse to give up. It’s really hard some days, isn’t it? I recently went to the reading of a friend’s play and all it did was make me feel frustrated that I haven’t found a way to fund a production of “Room to Grow” the musical I wrote with Laura Hall. I don’t want to be depressed and jealous – especially the latter. I don’t like what it says about me but I’d be lieing if I claimed not to be. I agree with everyone else, we all go through this at one level or another. I think the creative life is a mecca for insecurity simpply because we are putting our souls out there for others to view, question, critique. If people don’t like what we provide, it can be extremely heartbreaking. I have lost plenty of writing due to various silly circumstances, and it is a nightmare to go through. Bad luck on the save issue. You need to set your software to autosave. Now I use Scrivener I have that set to create a backup with the location a dropbox folder when I quit the program. Then I always have an “in the cloud” backup in case my computer dies. Yeah, I keep hearing about DropBox, but is it secure? I think so, I haven’t had any problems so far, and I have been using it for a few years. Well it is free so I would say download it and check it out. Put in a few non-important things so you can get a feel for how it works and if you like it. Either way, you will know then. You shouldnt question yourself, if your doing it then keep doing it until it stops making you happy. I should take advice on spreading myself too thin, but I can never write when unless Im busy. Thanks for stopping by my blog yesterday. I don’t have much to say that others haven’t already said. I want to HUG you first off, if that’s all right. Well, I just have, LOL. Second, I want to say you already are a proper writer. It’s in your soul. Even if you take a hiatus and don’t write anything for a few weeks or a month. . .
You will get there. You are a talented writer. I can tell through your blogs. You have a natural creativity. I think it is natural for us to feel insecure as writers because we feel the need for feedback at times, or we wonder, “Could this be crap?” I have felt insecure today despite the fact I have a story being released in an anthology next month. I found out the official publication today, yet I was also turned down for an education job. And, my grandmother, who is one of my special editors, did not sound remotely thrilled by the first part of my book. I had to remind myself although it is written for a wide audience, it is written from a male perspective and is a different kind of book and it’s gained attention from professionals. I have to remind myself of things like that, but I still have much to learn. There are so many great writers out there; many I admire. Sorry for the long response. I know how you feel. We’re blind wondering through a jungle without a map or navigation device. CONGRATULATIONS with the anthology honey! Hang in there. We all have insecure days, but don’t give up. So sorry about your lost pages….so so sad. I once lost a whole paper in nursing school I had no back up for, because I hadn’t hit save and only had it written on the computer. My then 3 year old daughter went up to the computer and pressed the power button off. I had to go to the other room for a bit. I know it’s a late one but here goes. It’s hard enough having the time and courage to write, let alone losing work! Hang in there – your site is awesome btw. I sometimes wonder why writing brings insecurities out from us: getting a proper job has probably kept a few writers from losing their mind! What SydneyAaliyah said! A to do list – mine frequently gets carried over to the next day of the diary but I don’t stress over it, I just make sure I do the things I absolutely have to do and muse on the others – they get done eventually. Helps if you add a few things in that you know you’ll be doing regardless (tea/school run etc) cos crossing them off makes it look good! But you’re clearly meant to write! Hi Vikki! I am so sorry about you losing your work. Are you sure it’s lost though? Perhaps you could have one place where you keep your old edits and another for your new edits? I’ve found this has helps me … One day I thought I lost a whole batch of poems I wrote and I almost died. Yes, really! And at that moment I realised not to listen to all the voices in my head that question why I do what I do. If I didn’t do it then I would die LOL, and isn’t a love for something a good enough reason to do it? Thanks for your post! It’s awesome! That’s annoying for you but I admire how you kept going after the fall. 🙂 What’s your book about?